THE photographed ad on this page is one of the many ads that has been appearing in leading print and electronic media of the country since September. Issued by the gutkha industry, the ads term the ban on the chewing tobacco unfair and question why the government has not banned cigarette. Since the introduction of the Food Safety and Standards Authority Act (FSSA) rules in August 2011, as many as 14 states have banned gutkha, known to be responsible for 80 per cent of oral cancer cases in the country. The ads prompted non-profits campaigning against gutkha to call an urgent press meet on October 18. The meet was also participated by representatives from the health ministry. Justifying the ban, Amal Pusp, director with the ministry, said, the government chose to ban gutkha as a higher number of people consume it. Of the 274.9 million adult tobacco users in India, 75 per cent consume smokeless tobacco, Pusp said. Vulnerable groups like women and teenagers consume more gutkha than cigarette. About 18 per cent women consume smokeless tobacco, while only 3 per cent smoke tobacco, including bidi, he said, citing figures from Global Adult Tobacco Survey of 2010. Pusp, however, showed helplessness when fielded questions related to weak regulations on cigarette. “I agree that cigarette is equally harmful but till now there is no legislation under which it can be banned,” he said. Both cigarette and gutkha are covered under the Cigarettes and Other Tobacco Products Act (COTPA) of 2003, which only regulates tobacco products. Gutkha could be banned only after FSSA came into being. The Act considers gutkha as a food product and allows banning any food item containing injurious substance like nicotine. Unfortunately, cigarette is not a food item, Pusp added. A representative of Smokeless Tobacco Association, who does not wish to be named, alleges that the ministry is siding with the cigarette lobby using the policy loopholes. While supporting the ban, Jagdeep Chhokar of the Association of Democratic Reforms, says, “ITC Ltd, which controls 80 per cent of the Indian cigarette market, has been one of the major donors for political parties, including the Congress.” The Delhi non-profit recently studied the source of funds to political parties. One of the many facts cited in the advertisement reads like this: “1 pouch of gutkha contains 0.2 gram of tobacco verses 0.63 grams in cigarette.” Bhavna Mukhopadhyay, executive director of non-profit Voluntary Health Association of India, terms this misleading. 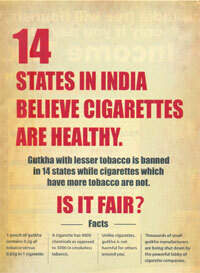 “The size of gutkha pouch varies from 1g to 3.5 g, which changes the percentage of tobacco in the mix. Moreover, there is no authentic estimate of contents for gutkha,” she says. Another fact claims that a cigarette contains 4,000 chemicals while gutkha has only 3,000. Monika Arora, director, health promotion and tobacco control of non-profit Public Health Foundation of India (PHFI), says, smokeless tobacco may have fewer chemicals but as many as 28 of them are carcinogenic. “Even a single cancer-causing chemical is enough to cause disease, disability and death,” she adds. The ad also claims that over 40 million people have lost their livelihood because of the ban. “Government estimates show that the total employment in the formal sector by the tobacco industry was seven million in 2004-05. It can’t come close to 40 million even if one adds employment by the informal sector,” Arora says. She also refutes the claim that farmers are growing tobacco in around 700,000 ha in the country. As per the Directorate of Tobacco Development, the area under cultivation for smokeless tobacco is just 40,000 ha. “The industry is trying to hide behind the livelihood issue when it is only concerned with its profits that are badly affected due to the ban,” says Mukhopadhyay. The Central Tobacco Research Institute in Andhra Pradesh has identified that crops like sugarcane, maize, paddy and cotton can be grown on the same soil, offering the farmers an alternative livelihood option. Besides, according to a 2010 Planning Commission report, the annual revenue generated by the gutkha industry is US $1.62 billion. But the expenditure on treatment of major diseases caused by it is six times more. “Constitutionally, all states should have implemented the ban,” Pusp said at the press meet. “We have written to all states but they are taking their time.” However, the main contention of the ad that cigarette should be banned remains and the government has no plan for it. The article also does not talk about the health hazards caused by the incessant spitting on streets, walls, and, indeed, all public spaces. It is a common sight for anyone walking on streets of UP to see people spitting while driving on their cars, bikes, buses, tempos, rickshaws. You are walking next to a railway track and you never know when a glob of spit from within a passing train might land on you. The spitters leave ample proof behind them--streets and walls of public buildings all across the northern stretch take no time to turn into shades of red, the hallmark of India. And Indians don't hesitate to carry the tradition abroad. When I entered the Indian Embassy in Birmingham, the UK, I knew I was home--the staircase walls were painted with bright splashes of red. Maybe the gutkha industry could also use this as a selling point for cigarettes--after all, which cigarette can boast of turning its consumer into a wall and street painting artist? The government should remove gutkha and pan masala from Cigarettes and Other Tobacco Products Act of 2003 for removing the discrepancies caused by the said Act.